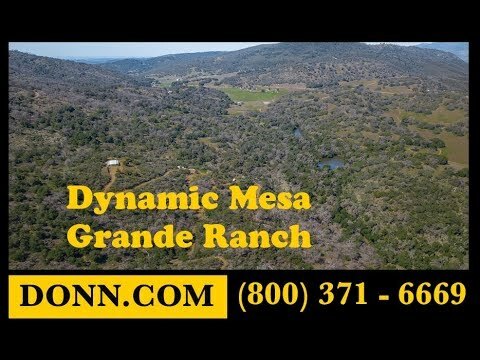 Located high atop historic Mesa Grande, one of the regions most coveted locales, lies this 80+/- acre property that holds a wealth of opportunity and utility. Currently home to a working ranch, this offering features extensive infrastructure that lends itself to a wealth of possibilities for growth, customization and enjoyment for generations to come. Located immediately off Mesa Grande Rd., the property invites you by way of a private road and gated entry. Beyond lies the 1000 esf. home, huge metal barn, outbuildings and expanse of its large acreage. Two potential home sites and helipad sit atop the highest vantage point of the property with extraordinary views. Beautifully groomed and accessible throughout, the property embodies all the beauty and serenity of its historic location. This rare and exceptional property must be seen to appreciate all that it has to offer. Extraordinary views, accessibility, expanse and infrastructure make this a truly dynamic and inviting property. This turn-key, working ranch demonstrates pride of ownership throughout its park-like setting. Well maintained roads and paths traverse the property allowing for ease of navigation and future use. Two ponds offer sanctuary to native fauna and a tranquil place to enjoy. There is a large population of Deer and Turkey on the property. The topography of the ranch also offers a pleasing and utilitarian diversity, ranging from flat to varying degrees of gentle slopes from which to appreciate the privacy and beauty of the area. High atop the property lies additional potential home sites with some of the most extraordinary and breathtaking views in the area. Also used as a helipad, there is ample space for a custom home build. The expansive metal barn lies just beyond the home and is the heart of the ranch. It is host to a one bedroom loft apartment, kitchenette, massive storage, 600 amp electrical with 10+ subpanels, water filtration system and more. Possibilities are vast for this space. An approved set of plans for a 4500 sq ft remodel/addition to the existing 1000 sq ft is available. Two wells with a 10k gallon and two 5k gallon holding tanks are in place, as are several septic systems servicing the homes and facilities. Livestock facilities and storage outbuildings are in place, as are the most impressive dog kennel facilities. Currently home to a world-renowned Retriever breeding and training program, the property is immaculate, the grounds are serene and the property stands prepared to welcome its next venture.